Few desserts have the universal appeal to the taste and preferences of a wide range of individuals like bananas do. With their naturally sweet flavor and high potassium content, bananas are a healthy choice for a sweet ending to a meal or as a special midday snack. Serve one or all of these baked banana recipes and listen as family and friends beg for seconds. Use a knife to slit one section of the banana skin (to allow steam to escape) and then replace. Place bananas in a shallow pan, and cover with a tin plate or baking pan. Bake until the skin is dark (about 10 minutes) and the banana yields to pressure when pressed with a fingertip or back of spoon. Remove bananas from skins, sprinkle with confectioner's sugar, and serve warm. Add the sugar and lemon juice; stir and cook until the sugar dissolves. Peel bananas and place in a baking pan. Brush about half the sauce over the bananas. Bake for 10 to 15 minutes, or until tender when pressed gently with the tines of a fork. Baste with remaining sauce as needed during baking to keep the bananas from drying out. Serve warm with the remaining sauce on the side. Slice the hot bananas into bite size pieces, and spoon the slices and sauce over vanilla ice cream. Top with a dollop of whipped cream and one perfect maraschino cherry. After adding the sugar and lemon juice to the melted butter, add 2 tablespoons creamy peanut butter to the mixture. Stir and cook for about one to two minutes until the sauce is smooth and creamy. Use the sauce to baste the bananas while baking, and serve the remainder on the side. Pull down a section of the banana skin, and loosen the fruit from the skin. Remove any strings from the fruit and then reposition fruit in the skin. Place the bananas in the baking dish. Bake until the skin is blackened and the fruit is fork tender (about 5 to 10 minutes). Remove the fruit carefully from the skins and cut in half. Place cut fruit on individual serving plates (should look like half circles). 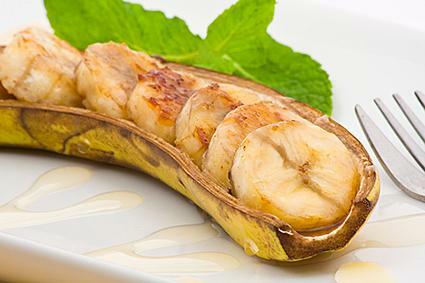 Pour hot sauce over bananas and serve as a side dish or dessert. Bring water to boil in small saucepan over high heat; add raisins carefully. Cook, stirring occasionally, for about 10 minutes or until raisins are soft. Dissolve the cornstarch in the lemon juice and stir until well blended. Drizzle into the raisin mixture slowly, stirring continuously to prevent lumping. Add the butter and vanilla; cook about one minute. Serve hot over baked bananas. As bananas ripen, their natural starch content turns to sugar, which means they just keep getting sweeter. However, the downside is the flesh becomes softer and softer, which could make them lose their shape or become mushy when baked. For best results in your baked banana recipes, opt for fruit with bright yellow peels and just a few brown spots. The fruit should feel firm to the touch and not yield to any finger pressure. Dip or baste the bananas with some type of citrus juice such as lemon, lime or orange juice, to keep the flesh from turning brown. Ripen green bananas quickly by placing them in a paper bag and closing the bag tightly. Put them in a warm place, like the top of the refrigerator. To keep bananas from becoming overripe, store them in the refrigerator. Bananas bake faster when left in the skin. Do not over bake them, as they become mushy and unappetizing. Substitute plantains for bananas for an exotic taste variation. Whether you serve your baked bananas plain, dress them up with whipped cream or other fixings, or use them as toppings for ice creams or puddings, you are sure to garner lots of praise for these delicious desserts.